The Sorcerer’s Apprentice sweeps a castle. The lights go out and he draws a sword. He calls out the Dark One. Te men knock each other around. Removing his cloak, we now see that this is a Dark One prior to Rumpelstiltskin. The Dark One uses his dagger to try to draw into the magic of a box. The Apprentice tells him that no Dark One has ever been able to open it. The Dark One fails. Anna meets Rumpelstiltskin. She tries to tell him she is Joan but he quickly stops her telling her he knows the truth. He will help her only if she is willing to make a deal. Rumpel is delighted by how overzealous Anna is and gets her to sign a contract. Rumpel hands Anna a vial and instructs her to put it in an old man’s tea. Anna is sent to the Apprentice. He is kind to her and invites her in for tea and biscuits. He sweeps and for a moment, Anna opens his teapot. Instead, she tosses the vial into a fire. Anna lies to Rumpel telling him she did as she was told. He tricks her by telling her that it was an anecdote to poison. Anna admits she did not give it to him. He shows her his crystal ball. Anna watches the Apprentice change into a mouse. Rumpel and Anna go to the Sorcerer’s castle. Rumpel tells her that she helped break a spell by being tempted by the dark side and turning away. Anna insists this is not true, as she would never have poisoned the old man. He tells her she will spend her life in his tower unless she can kill him. He taunts her as she holds a sword to him. Anna is not able to do it. Anna cries. Rumpel captures a tear on his dagger telling her although she may have not wanted to hurt the old man she did consider killing Rumpel. He is now able to open the box revealing a purple hat with stars. Rumpel tells Anna that her parents came to him because they feared Elsa and wish that she had been born normal. They wanted to get rid of her powers. He then goes on and explains that this box captures magical power and whoever has it once fully charged will have unlimited power. The mouse drops on him biting him and forcing him to drop the box. 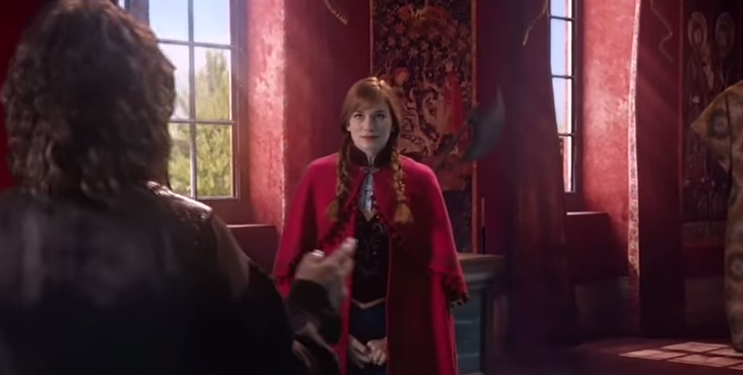 Anna is able to take the dagger. She realizes that the dagger controls Rumple. She now sees his plan to acquire magic so he can still have power and rid himself of the dagger. Anna orders Rumpel to send her and the box back to Arendelle. She adds in that he can never hurt her or Elsa. He sends her and the box home where to she returns to Kristoff and tells him what she learned. Rumpel has taken the strange box he found on his honeymoon at the house. He is familiar with the box. He uses his dagger to draw out a hat with stars. Emma asks Hook on a date. He is flattered and tells her to let him plan the night. She leaves the Diner and finds her car surrounded by a strange puddle of water. Hook visits Gold to have his hand reattached. Gold tells him it is not a good idea as the hand was his when he was a different person and may affect him. Hook laughs it off and again tells him to help him or he will see Belle and tell her about the dagger. Hook’s hand is reattached. Mary and David give Elsa books on curses. Emma comes out dressed up for her date. Mary takes pictures. Hook arrives with a rose dressed in modern clothing. When his hand is noticed, he tells Emma to call him Killian. Emma and Killian go to an Italian restaurant. Will is there and while trying to escape before Emma sees him ends up causing a scene. Killian almost loses control and believes his hand is controlling him. After the date, Killian is already trying to set the next one up. He and Emma kiss before she heads back in her apartment where her parents have been awake waiting for her. They are delighted she had a good date although David does not want details. Having no place to go, Will attempts to break into the library. Killian finds him and loses control beating on Will. He threatens Will not to tell anyone. Killian finds Gold and wants his hook back. He is desperate and frustrated when Gold has no interest in helping him. He stabs Gold with the hook, which has no effect on Gold. Killian tells him he cannot help it and believes that the hand possesses him. Gold agrees to help him once Killian agrees to a deal. Emma’s car hits ice and forces her to skid. He gets out of the car and sees the ice. Catching a glimpse of the Snow Queen, Emma follows her. She loses track of her. Her phone rings and Belle calls for her. Will is passed out in bloody broken glass on the library floor. Gold gives Killian a broom. It becomes animated. Gold tells him it will take them to an old friend. They follow the walking broom. It leads them to the Apprentice. Hook forces the man into a seat. Gold is able to draw the hat out. He uses it to trap the old man. At his shop he gives Killian the hook back. Killian wants their business to be done. Gold tells him the hand was not really controlling him but giving him permission to be the person he really is and Killian fell for the power of suggestion. He tells him that he has a tape that looks like Killian attacked and trapped the Apprentice in the hat on his own. Killian will be stuck doing more work for him. Emma goes to see Will in his jail cell at the station. She shows him they found him passed out with the book, ‘Alice’s Adventures in Wonderland’ as well as a picture of the Red Queen. She also asks who beat him. Killian enters the station. Will tells her he cannot remember what happened. David calls to Emma and tells her that Sara Fisher, the Snow Queen, is not part of Storybrooke’s census. Henry tells me that he has an idea. Somehow, villainous Mr. Gold has found a way to have a happy ending. He believes that Gold might know who wrote the book of Fairy Tales. He wants to go undercover. Henry goes to his grandfather and asks him to let him work at the pawnshop. Gold agrees to take Henry on as his own apprentice. Henry starts by sweeping the shop with the magical broom.